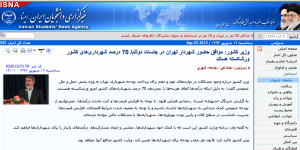 In a related news, the semi-official news agency Mehr reported today that according to the latest poll, 43 percent of Tehran residents have someone in their family who is unemployed. Ahmadinejad had insisted that the unemployment rate was below 10 percent. 70% bankrupt? Wow, that's close to our figures here in California, where we've a number of highly visible bankruptcies and many more municipalities in the red. didn't take you long to reach for your ever-present bowlful of specious crap. -- City of San Bernardino, Calif.
-- City of Stockton, Calif.
-- City of Central Falls, R.I.
tell us, fanboy, do you think that 1% is close to 70% ????????? can a person find fulfillment as a shameless liar? What a despicably dishonest load of crap from a liar whose greatest fear is deportation to the terrorist country he propagandizes. Iranians have no shame about lying. Uskowi- you are terribly treating the story as though the Nation is heading into an economic standstill next week! ,why don't you take a visit to Pakistan and India and see how municipalities there are walking the tightropes and yet as you know Pakistan is a child and darling of the US!and India is the world's biggest democracy!. I've learnt over the years, not to trust ANY economic report on Iran..They almost give the impression Iran's going to end tomorrow. We have been publishing your many comments on this blog for a long time, as the pages of this blog testify. Your most recent comments started with a shameful attack on the blog authors and their integrity. This post is a report on ISNA and Mehr's reports on the sobering economic data coming from Iran. As painful as the post might have been to you, it does not give you license to insult the bloggers. Your post was deleted by me. The content of the post is simple: Ahmadinejad lied to the nation on the state of economy and unemployment, and the situation is worse than he wanted us to believe. Now new ministers (and not me) are giving us more realistic numbers. I believe what they are doing is correct. The people are entitled to know the state of their country’s economy. That’s why I supported Rouhani, knowing he would be a much more honest leader, and his first few days in office is supporting that belief. People should know the government is facing enormous challenges and needs time and wise policy to correct the mistakes of the past. You are not arguing that the citizens must have been kept ignorant by their government of the facts about the state of their economy, are you? Ahmadinejad did that and in the process helped ruin the economy, with empty sloganeering and giving cash handouts to create a false illusion of prosperity. Dear Uskowi,it's not just Ahmadinejad but the whole regime that are liars and cheats. Funny thing about this regime is,when they have given $17 Billion to Assad's Syria or building hospitals and schools free of charge at Iranian people's expense for Iraq,a oil rich country.For this regime Iranian people come last in the queue. where do you get that figure from?? Where have you gotten a license to post your nonsenses and censor others, under the "pretexts' that their conclusions or investigations of facts amounts to "Insults" or are non related to issues. "I swear to the omnipotent GOD that I will safeguard the official religion and the system of the Islamic Republic of Iran and the constitution". - match your Zionist propaganda efforts. You have published converged photo of the E. Barak with young man which apparently showed one of your staff members....and you ignored requests to name that man. Like your respected Netanyahu said, sometimes people use sheep skin to cover their true intentions. Someone also said that Mat has changed 180 degrees his rhetoric about the israel during last year.